“GOOD BUDDIES” Get ready to hit the road with U.S. ACE, Marvel’s truckin’ hero! 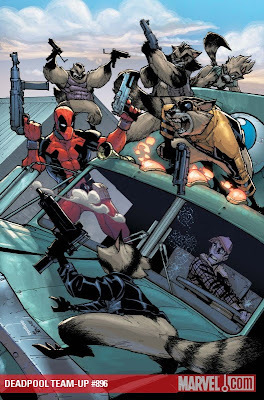 He’s back behind the wheels of a big rig with an unlikely partner -- DEADPOOL -- and together they’re puttin’ the hammer down, ridin’ the open road, and decapitatin’ giant killer raccoons. Good times…if they don’t kill each other first! Featuring the working-class villainy of THE HIGHWAYMAN, and the world premiere of the chart-toppin’ “Ballad of U.S. Ace,” composed and performed by Wade Wilson. What part of “Collector’s Item” don’t you understand?